Posted on January 30, 2019 by Billy S.
The payment integrations offer form owners the ability to collect payments with their order forms. By connecting to the payment processor, collecting payments makes online transactions much safer. Most services add a small processing fee to each transaction (although Formsite doesn’t), and some form owners ask how to add transaction fees to each order. Most payment processing services charge around 3% for each transaction. While that’s not a large amount on individual amounts, those fees add up with many transactions. Other times the organization’s funding or reimbursements only cover the amount of the order. These cases may not be able to absorb extra fees. The easiest way to add any fees is to add the appropriate pricing item to the form. 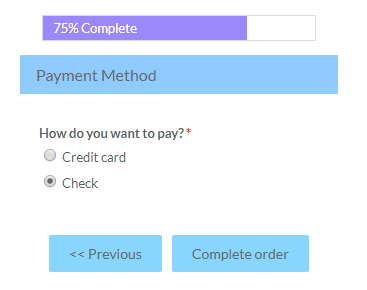 For example, if the transaction fee is 3%, adding a Radio Button Percent item is needed. The percentages use a decimal format so add 3% as .03. Also be sure the item is set to apply the percentage as an addition, not a discount. Do not enable the Pay By Check payment integration. Add the Pay By Check information to the success page. Note that this technique bypasses the payment process so if a Notification’s conditional logic sends after a successful payment, another Notification will need to be made without that logic.